Recently introduced, 8 new output code types are now available including 4 analog outputs, 2 analog outputs, and 4 contact output modes. Analog output signals can be 4 to 20mA DC or 1 to 5V DC with output and control input combinations including: 4 analog channel, 2 analog channel + 2 contact output, and 2 analog channel + 1 contact output + 1 contact input modes. Contact outputs can be allocated for alarm or pulse output use, and new output options include 4 contact output and 3 contact output + Modbus modes (for more information, see Table 1 for a list of new specifications). M-System’s model 53U Multi Power Monitor offers standard features including a 96-mm-square size (1/4 DIN), Euro terminal conn-ections, a bracket-mountable design, and IP50 compliance for front panel mounting. This section introduces the model’s original specifications and newly added features. This single unit can be used for single-phase/2-wire, 3-wire, and three-phase/3-wire and 4-wire systems. In addition, the 53U’s flexibility and advanced functionality give users the freedom to select, measure, and display the readings they need from a large number of characteristics including: voltage, current, active power, reactive power, power factor, frequency, apparent power, electrical energy, reactive energy, higher harmonics*, peak value, minimum value, demand and others. The 53U features a 4-line display. The top 3 lines display instantaneous values for readings such as voltage, current, power and others. Character size has been maximized for improved visibility. In a design that facilitates daily monitoring by making it easy to assess current values with a single glance, the numerical readouts are accompanied by 3 bar graphs, each of which is linked to the adjacent display value. The bottom line of the display provides text-based information. It usually shows accumulated energy count and is automatically switched to an alarm indicator. The flashing text tells the user which variable is in an alarm mode. It also helps the user in programming the monitor by indicating menu items in text format making it easy to navigate through the programming menu without consulting instruction manuals. The new 53U specifications also give users the ability to set the display refresh rate, allowing the process to be slowed so that measured values can be easily noted by hand. Display item combinations are modified by pressing the front keys (voltage —> current —> power...). If the monitor control keys are untouched for a certain time period, the monitor automatically returns to the user’s default view. A password-protected lock may be set to prevent the operator from accidentally changing settings such as CT ratio and VT ratio (primary/secondary ratings). RS-485/Modbus communication is a standard feature of the 53U. All measured and computed values from multiple power supply lines can be sent to a host PC to be monitored and analyzed. Communications functionality can also be utilized to configure settings such as alarm values and backlight brightness. Open collector output is available for either energy count or alarm. Contact function, pulse weight, alarm setpoints and other parameters are freely selectable as well. During the system’s startup test, the contact signal can be used in simulated mode, so that pulse signals can be sent to confirm connection without actually connecting to a live input. External open collector inputs is typically used to reset energy count memory, switch monitoring condition for daytime energy count, nighttime energy count, or input monitoring of ON time for equipment. The signal can be also monitored at the host system via Modbus, which can start/stop monitoring according to ON/OFF status of a load (e.g. motor running or not). Users may select either 2 or 4 analog output channels, and signals can be 4 to 20mA DC or 1 to 5V DC. Measured characteristics can be assigned to each channel as desired and output. The 53U also features a loop test function that lets users set output to desired values during the system’s startup testing, a capability that has been well received by users of the MX-UNIT Series and other M-System products. M-System’s PC configurator software (model: 53UCFG) is available for download from our website (www.m-system.com) and can be used to configure the 53U Multi Power Monitor’s settings, manage setting files, and compare editing screen settings to device settings on the user’s PC. Although the same settings can be configured from the unit’s front panel, the 53UCFG software dramatically accelerates and simplifies the process. M-System’s PC Recorder Light, model MSR128LUx, is available for use with the 53U Multi Power Monitor and is available for download free of charge on our website (www.m-system.com) (see Figure 2). 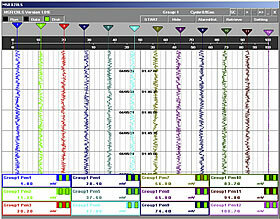 This software allows a Windows computer to act as an industrial recorder to generate trend and numerical displays for data collected by the 53U. *Higher harmonics up to the 31st order can be measured for current and voltage. Copyright (C) 2008-2018 M-System Co., Ltd. All rights reserved.